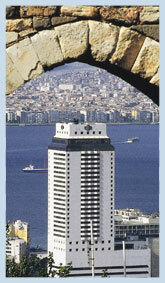 The city, known as "Beautiful Izmir", lies on the shores of a large bay furrowed by ships and yachts and encircled by mountains. The climate is a mild one. and during the summer the heat is tempered by the constant, refreshing sea breezes. Behind the palm-lined promenades and avenues, the city gently ascends in terraces to the slopes of surrounding hills. Along the coastline from Izmir, you will discover magnificent ancient sites such as Troy, Pergamon, Aphrodisias, Didyma, and of course Ephesus. A cosmopolitan and lively place at anytime, Izmir offers the ideal setting for a meeting destination with an abundant of luxurious hotels. the original city was established in third millennium B.C. (at present day Bayrakli) and at that time shared with Troy, the most advanced culture in Western Anatolia. 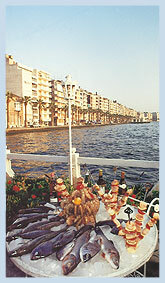 Homer was born in Izmir and resident here during the Ioanian Federation in the first millennium B.C.. Today, it is third largest city in Turkey and its port is second only to Istanbul. Shopping: In the streets of the Kemeralti Market, it is possible to find fascinating antiques, both fine and fun jewelry, a great variety of clothing and the dried figs and sultanas for which Izmir is famous. Havra Sokak is particularly interesting for its old buildings and synagogues, while the best modern shopping areas are along the Kordon promenade. 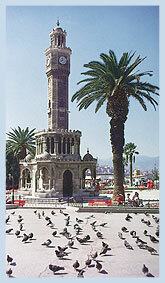 Art, Culture and Entertainment: Izmir has for many years enjoyed a reputation as a cosmopolitan and cultural city. The Izmir Cultural Center hosts performances of opera, ballet and musical concerts, and the city is home to the Aegean Philharmonic Orchestra as well as a thriving theatrical scene. During the annual Izmir International Festival, international and Turkish artists perform at various venues in the city and surrounding area, including the theater at Ephesus. Take a horse-drawn carriage along the promenade or absorb the lively atmosphere of the bars and cafes around Pasaport Pier. (Mt. Nightingale) where she spent her last days. Meeting Halls Total Capacity Maximum capacity of the Largest Hall Exhibition Space in sq. m.